Welcome back to my weekly Breaking Bad reviews! This week we have a "Rabid Dog." And once again, spoiler alert if you haven't watched it yet. Another week, another excellent episode of one of the best shows on television. My praise probably seems redundant, but can any of you honestly say the praise isn't warranted? Didn't think so. 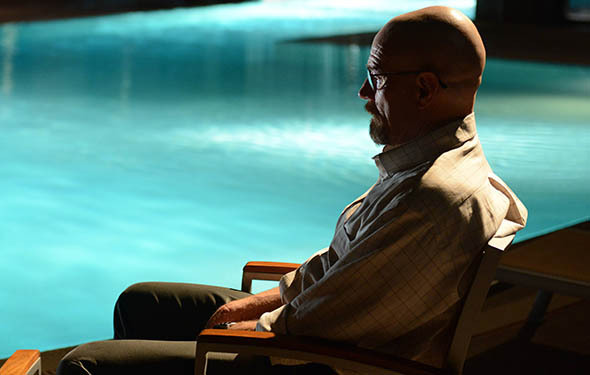 I love the parallels between different scenes of Walt sitting at a pool. After last week's excellent and extremely tense "Confessions," it seemed like it would be difficult to keep that momentum going, and at first, I was a bit disappointed with the beginning of the episode. I liked that it picked up immediately (or so I thought) with Walt entering the house, gun drawn, ready to kill Jesse if absolutely necessary. The disappointment mostly came from that scene, as I knew that Jesse wouldn't burn down the house but I wanted to see immediately what stopped him, and I hoped beyond hope it wasn't just a little change of heart since that would've been such a cop out. Luckily that answer finally came halfway through the episode. That was a very bold and interesting structural choice and in retrospect I think it was a great move on their part. I thought of different scenarios for what could've stopped Jesse, from the kids coming home to Walt doing something to stop him, but I NEVER would've guessed Hank would be the one to step in and then get Jesse out of there right before Walt showed up. From the moment Hank appeared, I felt a mixture of delight, excitement, and dread about where this uneasy partnership would go. Meanwhile, the White family is now staying in quite a fancy hotel, probably for as long as possible, and I'm just glad that his family is seeing through Walt's lies. The story about the gas pump malfunctioning was pretty sloppy by Heisenberg standards, and even if Junior just thought it was Walt passing out again, supposedly due to the cancer, I loved the fact that no one believed him. Of course Skyler knows not to believe those stories by now, and the great scene between them in the hotel room showed a few interesting things to me. First there's the fact that Walt still genuinely cares about Jesse. We saw that earlier in the episode when he shot down Saul's suggestion to essentially put Jesse down like Old Yeller, but the hotel scene solidified it. Walt told Skyler Jesse was a human being, not some "rabid dog" that had to be put down (hard not to react like this when something like that happens) and got visibly angry at the mere suggestion of doing so. The other interesting thing about that scene is Skyler; she was so adamantly opposed to murder last year in "Fifty-One," yet once her family is potentially threatened she's ready to spring into action and gets things done. She wants Jesse dead to ensure her family's safety, and as she so succinctly puts it, so many people have died because of them, "what's one more?" Speaking of a desire for murder, it's really ironic to me that Walt, the cold-blooded killer, is the only person who DOESN'T want anyone to be killed anymore, yet his murderous ways have rubbed off on the rest of the family. Skyler wants Jesse dead, and proving that they really are sisters, Marie has murder on her mind as well. In a very chilling scene, she told her therapist she spent hours online looking up untraceable poisons and that even though she would never intend to act on those thoughts, it still felt really good to think about. Then there's Hank, who flat out told Gomez that he hoped his plan led to Walt killing Jesse so the degenerate drug addict would be out of the way and Hank would have some physical evidence against Walt on tape. Here Hank also takes the family connection one step further in proving that he can be just as ruthless as Walt when he's going after something he really wants. Then there's that final scene. As much as Jesse wants to take Walt down, he's still justifiably terrified of the man. I was so angry when it was revealed that Walt really was in the plaza alone to try to talk to Jesse about everything because he still genuinely cares about the poor guy and that man standing nearby was just some guy there with his daughter. 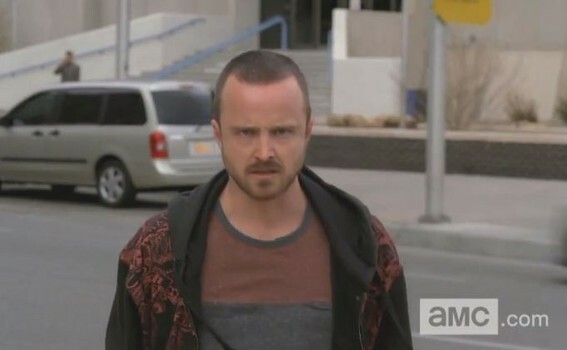 I wasn't angry at Jesse because considering how close to Walt the guy was standing and how he seemed to be staring Jesse down, I'd be just as suspicious if I were him. That anger was more because Jesse's paranoia may be what screws him over, after Jesse's little threatening phone call led to Walt calling Todd and telling him he may have another job for his uncle. Of course Jesse does seem to have something else up his sleeve, and in my mind (as well as my fellow Fanboy Sam Lascio's), it will involve Walt's family since Jesse told Walt he would get him where he really lives. Jesse knows that the most important thing to Walt is his family, so I'm really interested to see where this goes. Since this show is now so dark, I really appreciate any humor that's worked into these episodes, and the conversation between Walt and Saul was full of it, from Saul's "Deep down, he loves me" to Walt referring to Badger and Skinny Pete as "Beaver and the other one." Hank referring to Walt as Mr. Rogers with a tumor also really made me laugh. Another shout out to Breaking Bad story sync (seriously, it's great) this week for highlighting the shellfish poison, called saxitoxin, that Marie mentioned to her therapist. My pharmacy school training helped me understand a lot of what was included there, including the mechanism of action and whatnot. I also love that the chemical structure was included. This really is one of the best casts on television, and they're all really on top of their game. Since these episodes will be eligible for the 2014 Emmys, I would not be surprised if all four of the adult family members and Aaron Paul were nominated. Bryan Cranston and Aaron Paul are pretty much guaranteed nominees in my opinion, but Anna Gunn (Skyler), Betsy Brandt (Marie), and Dean Norris (Hank) are all stellar this year. Also a big shout out to Dave Porter's phenomenal musical score for the series. I forgot to mention last week how great I thought that music cue in the final scene was, and I loved how this episode started with a variation on a theme called "Disassemble" from the episode "Buyout," when Walt, Mike, and Todd are dissembling the dirt bike and disposing of Drew Sharp, and then the cue turned into something more sinister and intense when Walt was preparing to confront Jesse. Music is used sparingly in this show, but when the score kicks in, it's always extremely effective. I mean seriously, just listen to Crawl Space and tell me it's not an amazing fit for the end of the amazing episode of the same name. That about wraps it up this week. Thank you to anyone who actually reads through my ramblings, and while you wait for next week's episode, check out the rest of the site, where all of the other Fanboys (and girls) are doing some great work. Assuming you don't let any rabid dogs get the best of you, I'll see you all next Sunday night for "To'hajiilee"!